Dimensions 1.25 by 8.50 by 11 in. Nineteenth-Century Literature Criticism assembles critical responses to the works of 19th-century authors of all sortsÃ¢? ?novelists, poets, playwrights, journalists, philosophers, political leaders, scientists, mathematicians and writers from other genresÃ¢? ?from every region of the world. Each of the more than 290 volumes in this long-standing series profiles approximately 3-6 novelists, poets, playwrights, journalists, philosophers or other creative and nonfiction writers by providing full-text or excerpted criticism reproduced from books, magazines, literary reviews, newspapers and scholarly journals. Clear, accessible introductory essays followed by carefully selected critical responses allow end-users to engage with a variety of scholarly views and conversations about authors, works and literary topics. Introductory essays are written and entries compiled by professional literature researchers and other subject matter experts. A full citation and annotation precede each of the approximately 50 essays per volume; many include an author portrait. The series currently covers nearly 600 authors and also includes numerous entries focusing on literary topics and individual works. Students writing papers or class presentations, instructors preparing their syllabi, or anyone seeking a deeper understanding of the 19th century will find this a highly useful resource. This edition contains multiple works--typically stories or entire novels--that are found in different collections. Below find each work in this edition grouped by how you can find each. from Gale Group (December 16, 2016); titled "Nineteenth Century Literature Criticism: Excerpts from Criticism of the Works of Nineteenth-century Novelists, Poets, Playwrights, Short-story Writers, & Other Creative Writers"
About: Nineteenth-Century Literature Criticism assembles critical responses to the works of 19th-century authors of all sortsâ? 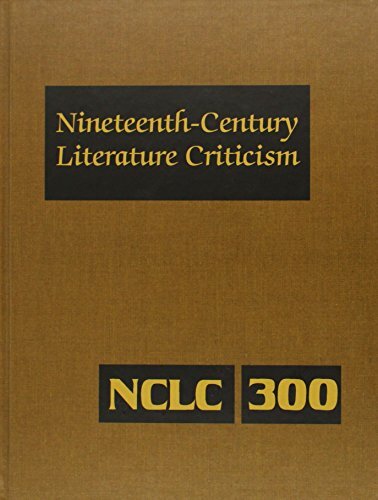 from Gale Group (November 11, 2016); titled "Nineteenth Century Literature Criticism: Excerpts from Criticism of the Works of Nineteenth-century Novelists, Poets, Playwrights, Short-story Writers, & Other Creative Writers"
from Gale Group (October 28, 2016); titled "Nineteenth Century Literature Criticism: Excerpts from Criticism of the Works of Nineteenth-century Novelists, Poets, Playwrights, Short-story Writers, & Other Creative Writers"
from Gale Group (October 7, 2016); titled "Nineteenth Century Literature Criticism: Excerpts from Criticism of the Works of Nineteenth-century Novelists, Poets, Playwrights, Short-story Writers, & Other Creative Writers"
from Gale Group (September 16, 2016); titled "Nineteenth Century Literature Criticism: Excerpts from Criticism of the Works of Nineteenth-century Novelists, Poets, Playwrights, Short-story Writers, & Other Creative Writers"
from Gale Group (August 26, 2016); titled "Nineteenth Century Literature Criticism: Excerpts from Criticism of the Works of Nineteenth-century Novelists, Poets, Playwrights, Short-story Writers, & Other Creative Writers"
from Gale Group (August 5, 2016); titled "Nineteenth Century Literature Criticism: Excerpts from Criticism of the Works of Nineteenth-century Novelists, Poets, Playwrights, Short-story Writers, & Other Creative Writers"
from Gale Group (July 15, 2016); titled "Nineteenth Century Literature Criticism: Excerpts from Criticism of the Works of Nineteenth-century Novelists, Poets, Playwrights, Short-story Writers, & Other Creative Writers"
from Gale Group (June 10, 2016); titled "Nineteenth Century Literature Criticism: Excerpts from Criticism of the Works of Nineteenth-century Novelists, Poets, Playwrights, Short-story Writers, & Other Creative Writers"
from Gale Group (May 20, 2016); titled "Nineteenth Century Literature Criticism: Excerpts from Criticism of the Works of Nineteenth-century Novelists, Poets, Playwrights, Short-story Writers, & Other Creative Writers"
With Lawrence J. Trudeau (other contributor) | from Gale Group (March 7, 2016); titled "Nineteenth Century Literature Criticism: Criticism of the Works of Novelists, Philosophers, and Other Creative Writers Who Died Between 1800 and 1899, From the First Published Critical Apprai"
With Lawrence J. Trudeau (other contributor) | from Gale Group (March 7, 2016); titled "Nineteenth-Century Literature Criticism: Criticism of the Works of Novelists, Philosophers, and Other Creative Writers Who Died between 1800 and 1899, from the First Published Critical Apprai"
With Lawrence J. Trudeau (other contributor) | from Gale Group (February 5, 2016); titled "Nineteenth Century Literature Criticism: Criticism of the Works of Novelists, Philosophers, and Other Creative Writers Who Died Between 1800 and 1899, from the First Published Critical Apprai"
With Lawrence J. Trudeau (other contributor) | from Gale Group (December 18, 2015); titled "Nineteenth-Century Literature Criticism: Criticism of the Works of Novelists, Philosophers, and Other Creative Writers Who Died Between 1800 and 1899, from the First Published Critical Apprai"
With Lawrence J. Trudeau (other contributor) | from Gale Group (December 9, 2015); titled "Nineteenth Century Literature Criticism: Criticism of the Works of Novelists, Philosophers, and Other Creative Writers Who Died between 1800 and 1899, from the First Published Critical Apprai"
With Lawrence J. Trudeau (other contributor) | from Gale Group (November 13, 2015); titled "Nineteenth-Century Literature Criticism: Criticism of the Works of Novelists, Philosophers, and Other Creative Writers Who Died between 1800 and 1899, from the First Published Critical Apprai"
With Lawrence J. Trudeau (other contributor) | from Gale Group (October 30, 2015); titled "Nineteenth-Century Literature Criticism: Criticism of the Works of Novelists, Philosophers, and Other Creative Writers Who Died Between 1800 and 1899, from the First Published Critical Apprai"
With Lawrence J. Trudeau (other contributor) | from Gale Group (October 9, 2015); titled "Nineteenth-century Literature Criticism: Criticism of the Works of Novelists, Philosophers, and Other Creative Writers Who Died Brtween 1800 and 1899, From the First Published Critical Apprai"
With Lawrence J. Trudeau (other contributor) | from Gale Group (September 18, 2015); titled "Nineteenth-Century Literature Criticism: Criticism of the Works of Novelists, Philosophers, and Other Creative Writers Who Died Between 1800 and 1899, from the First Published Critical Apprai"
With Lawrence J. Trudeau (other contributor) | from Gale Group (August 25, 2015); titled "Nineteenth-Century Literature Criticism: Criticism of the Works of Novelists, Philosophers, and Other Creative Writers Who Died Between 1800 and 1899, from the First Published Critical Apprai"
With Lawrence J. Trudeau (other contributor) | from Gale Group (August 11, 2015); titled "Nineteenth-Century Literature Criticism: Criticism of the Works of Novelists, Philosophers, and Other Creative Writers Who Died between 1800 and 1899, from the First Published Critical Apprai"
With Lawrence J. Trudeau (other contributor) | from Gale Group (July 14, 2015); titled "Nineteenth-Century Literature Criticism: Criticism of the Works of Novelists, Philosophers, and Other Creative Writers Who Died Between 1800 and 1899, from the First Published Critical Apprai"
With Lawrence J. Trudeau (other contributor) | from Gale Group (December 10, 2014); titled "Nineteenth-Century Literature Criticism: Criticism of the Works of Novelists, Philosophers, and Other Creative Writers Who Died between 1800 and 1899, from the First Published Critical Apprai"
With Lawrence J. Trudeau (other contributor) | from Gale Group (November 3, 2014); titled "Nineteenth-Century Literature Criticism: Criticism of the Works of Novelists, Philosophers, and Other Creative Writers Who Died between 1800 and 1899, from the First Published Critical Apprai"
With Lawrence J. Trudeau (other contributor) | from Gale Group (October 14, 2014); titled "Nineteenth-Century Literature Criticism: Criticism of the Works of Novelists, Philosophers, and Other Creative Writers Who Died Between 1800 and 1899, from the First Published Critical Apprai"
With Lawrence J. Trudeau (other contributor) | from Gale Group (September 5, 2014); titled "Nineteenth-Century Literature Criticism: Criticism of the Works of Novelists, Philosophers, and Other Creative Writers Who Died Between 1800 and 1899, From the First Published Critical Apprai"
With Lawrence J. Trudeau (other contributor) | from Gale Group (August 15, 2014); titled "Nineteenth-Century Literature Criticism: Criticism of the Works of Novelists, Philosophers, and Other Creative Writers Who Died between 1800 and 1899, from the First Published Critical Apprai"
With Lawrence J. Trudeau (other contributor) | from Gale Group (July 25, 2014); titled "Nineteenth-Century Literature Criticism: Criticism of the Works of Novelists, Philosophers, and Other Creative Writers Who Died between 1800 and 1899, from the First Published Critical Apprai"
With Lawrence J. Trudeau (other contributor) | from Gale Group (July 1, 2014); titled "Nineteenth-Century Literature Criticism: Criticism of the Works of Novelists, Philosophers & Other Creative Writers Who Died Between 1800 and 1899, from the First Published Critical Appraisal"
With Lawrence J. Trudeau (other contributor) | from Gale Group (May 23, 2014); titled "Nineteenth-Century Literature Criticism: Criticism of the Works of Novelists, Philosophers, & Other Creative Writers Who Died Between 1800 and 1889, From the First Published Critical Appraisa"
With Lawrence J. Trudeau (other contributor) | from Gale Group (April 25, 2014); titled "Nineteenth-Century Literature Criticism: Criticism of the Works of Novelists, Philosophers, and Other Creative Writers Who Died Between 1800 and 1899, from the First Published Critical Apprai"
With Lawrence J. Trudeau (other contributor) | from Gale Group (April 4, 2014); titled "Nineteenth-Century Literature Criticism: Criticism of the Works of Novelists, Philosophers, and Other Creative Writers Who Died Between 1800 and 1899, from the First Published Critical Apprai"
With Lawrence J. Trudeau (other contributor) | from Gale Group (March 14, 2014); titled "Nineteenth-Century Literature Criticism: Criticism of the Works of Novelists, Philosophers, and Other Creative Writers Who died Between 1800 and 1899, From the First Published Critical Apprai"
With Lawrence J. Trudeau (other contributor) | from Gale Group (February 21, 2014); titled "Nineteenth-Century Literature Criticism: Criticism of the Works of Novelists, Philosophers, and Other Creative Writers Who Died Between 1800 and 1899, from the First Published Critical Apprai"
With Lawrence J. Trudeau (other contributor) | from Gale Group (January 31, 2014); titled "Nineteenth-Century Literature Criticism: Criticism Of The Works Of Novelists, Philosophers and Other Creative Writers Who Died Between 1800 and 1899 From the First Published Critical Appraisa"
With Lawrence J. Trudeau (other contributor) | from Gale Group (January 10, 2014); titled "Nineteenth-Century Literature Criticism: Criticism of the Works of Novelists, Philosophers, and Other Creative Writers Who Died brtween 1800 and 1899, from the First Published Critical Apprai"
With Lawrence J. Trudeau (other contributor) | from Gale Group (December 21, 2012); titled "Nineteenth-Century Literature Criticism: Criticism of the Works of Novelists, Philosophers, and Other Creative Writers Who Died Between 1800 and 1899, from the First Published Critical Apprai"
About: Nineteenth-Century Literature Criticism assembles critical responses to the works of 19th-Century authors of all sorts -- novelists, poets, playwrights, journalists, philosophers, political leaders, scientists, mathematicians and writers from other genres -- from every region of the world. With Lawrence J. Trudeau (other contributor) | from Gale Group (November 30, 2012); titled "Nineteenth-Century Literature Criticism: Criticism of the Works of Novelists, Philosophers, and Other Creative Writers Who Died Between 1800 and 1899, From the First Published Critical Apprai"
With Lawrence J. Trudeau (other contributor) | from Gale Group (November 9, 2012); titled "Nineteenth-Century Literature Criticism: Criticism of the Works of Novelists, Philosophers, and Other Creative Writers Who Died between 1800 and 1899, from the First Published Critical Apprai"
With Lawrence J. Trudeau (other contributor) | from Gale Group (October 19, 2012); titled "Nineteenth-Century Literature Criticism: Criticism of the Works of Novelists, Philosophers, and Other Creative Writers Who Died Between 1800 and 1899, from the First Published Critical Apprai"
About: Nineteenth-Century Literature Criticism assembles critical responses to the works of 19-Century authors of all sorts -- novelists, poets, playwrights, journalists, philosophers, political leaders, scientists, mathematicians and writers from other genres -- from every region of the world. With Lawrence J. Trudeau (other contributor) | from Gale Group (September 7, 2012); titled "Nineteenth-Century Literature Criticism: Criticism of the Works of Novelists, Philosophers, and Other Creative Writers Who Died Between 1800 and 1899, from the First Published Critical Apprai"
With Lawrence J. Trudeau (other contributor) | from Gale Group (August 17, 2012); titled "Nineteenth-Century Literature Criticism: Criticism of the Works of Novelists, Philosophers, and Other Creative Writers Who Died Between 1800 and 1899, From the First Published Critical Apprai"
With Lawrence J. Trudeau (other contributor) | from Gale Group (July 27, 2012); titled "Nineteenth-Century Literature Criticism: Criticism of the Works of Novelists, Philosophers, and Other Creative Writers Who Died Between 1800 and 1899, from the First Published Critical Apprai"
With Lawrence J. Trudeau (other contributor) | from Gale Group (July 1, 2012); titled "Nineteenth-Century Literature Criticism: Criticism of the Works of Novelists, Philosophers, and Other Creative Writers Who Died Between 1800 and 1899, from the First Publisheed Critical Appra"
With Lawrence J. Trudeau (other contributor) | from Gale Group (April 13, 2012); titled "Nineteenth-Century Literature Criticism: Criticism of the Works of Novelists, Philosophers, and Other Creative Writers Who Died Between 1800 and 1899, From the First Published Critical Appra"
With Lawrence J. Trudeau (other contributor) | from Gale Group (April 13, 2012); titled "Nineteenth-Century Literature Criticism: Criticism of the Works of Novelists, Philosophers, and Other Creative Writers Who Died Between 1800 and 1899, from the First Published Critical Apprai"
With Lawrence J. Trudeau (other contributor) | from Gale Group (April 13, 2012); titled "Nineteenth-Century Literature Criticism: Criticism of the Workds of Novelists, Philosophers, and Other Creative Writers Who Died between 1800 and 1899, from the First Published Critical Appra"
With Lawrence J. Trudeau (other contributor) | from Gale Group (April 13, 2012); titled "Nineteenth-Century Literature Criticism: Criticism of the Works of Novelists, Philosophers, and Other Creative Writers Who Died Between 1800 and 1899, From the Published Critical Appraisals t"
With Lawrence J. Trudeau (other contributor) | from Gale Group (April 13, 2012); titled "Nineteenth-Century Literature Criticism: Criticism of the Works of Novelists, Philosophers, and Other Creative Writers Who Died Between 1800 and 1899, From th First Published Critical Apprais"
from Gale Group (October 1, 2010); titled "Nineteenth-century Literature Criticism: Excerpts from Criticism of the Works of Nineteenth-century Novelists, Poets, Playwrights, Short-story Writers & Other Creative Writers"
About: Here is a convenient source of commentary on the careers and works of acclaimed poets, novelists, short story writers, dramatists and philosophers who died between 1800 and 1899. About: A convenient source of critical commentary on the careers and works of acclaimed authors who died between 1800 and 1899.